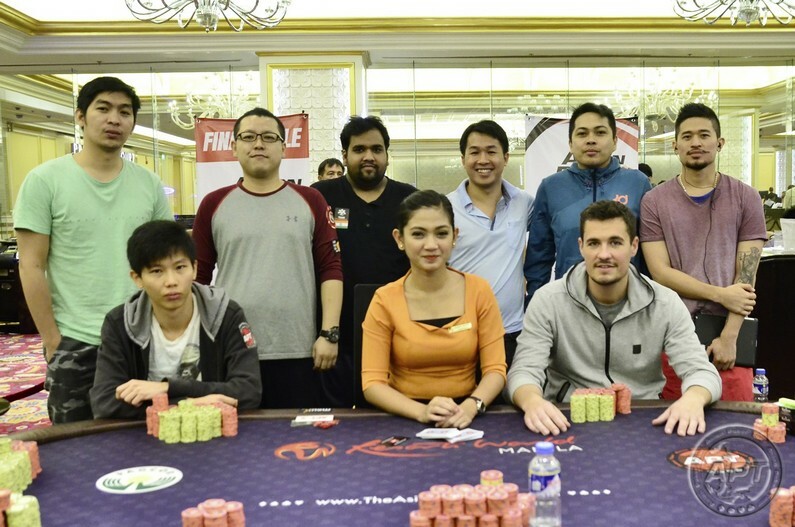 Day 3 of the APT Philippines 2015 Main Event at the Resorts World Manila (RWM) in Pasay City, Philippines started with 27 players and in just four hours of play, the eight-handed Final Table was set. The chip leaders in the final day of the highlight tournament of the nine-day poker festivities are a trio of previous APT champions; ranked first to third, Jojo Tech (Philippines) had 1.42 million in chips; Feng Zhao (Singapore) had 1.20 million; and Ha Duong (Vietnam) had 1.06 million. Tech, who won the APT Asian Series Cebu 2015 Main Event, showed his tricks consistently throughout the tournament and especially in Day 3. In one hand, he tanked-bet to 200,000 on the board 4♦ A♠ 5♣ 9♣ K♠ and had Sahil Agarwal calling. Tech tabled A♣ J♣ for the nutflush and took down the pot—just one of the many that brought him way past the million-chips mark. Like Tech, Zhao was one of the players who were always involved in huge pots. The Singaporean, who was last year’s APT Philippines Main Event champion, shaved off a good part of Flo Campomanes’ stack when Zhao’s K♥ 7♣ beat him on a board of K♦ J♥ 8♠ K♥ 9♥. Meanwhile Duong, who entered Day 3 as the runaway chip leader, did enough to stay among the big stack players. Duong was responsible for a number of bust-outs eliminating Jimmy Johan with pocket rockets; booting John King with K♣ J♦; and dispatching Ryan Hong with A♣ J♠. Duong won the APT Asian Series Cambodia 2012 Main Event title. While Tech, Zhao and Duong have the larger stacks with them entering the Final Table play plus their history of previous takedowns of APT main event titles, the other contenders in the final day will challenge them to the hilt. The final table includes Yoichi Uesugi, Julius Malzanini and Ian Brion, who are near the half-the-million chip mark; and Campomanes and Agarwal, who will work on a short-stack during the final day set to start at 1:30 PM on Wednesday (April 22nd). It’s the final day of the poker festivities at RWM on Wednesday but there are still two side events on tap; the $21,000 GTD 6 Handed – 10 Man Stop and as announced by tournament director Lloyd Fontillas during Main Event Day 3, another High Rollers with $10,500 buy-in both starting at 1:00 PM. For full details, check Events Schedule page. APT Philippines Championships 2018 Begins Today!